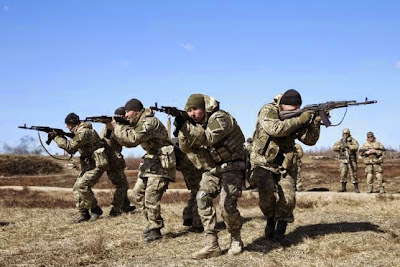 KIEV, Ukraine -- - Ukraine, locked in conflict with Russian-backed separatists in its east, on Thursday drew up a new security doctrine denouncing Russia's "aggression" and setting its sights on joining the U.S.-led NATO military alliance. Ukrainian newly mobilized paratroopers take part in tactical exercises during a military drill near Zhytomyr April 9, 2015. "For the first time in history a permanent member of the U.N. Security Council which possesses the nuclear weapon uses this factor to intimidate the international community and uses its military potential for annexation and seizing the territory of a European country," he said. Ukraine, at the center of a geo-political tug-of-war between Russia and the West, has grown close to the NATO alliance during the years since independence from the Soviet Union in 1991. The pro-Western leadership has prepared the way for a swerve in strategic direction by scrapping the "non-bloc" status introduced under ousted former president Viktor Yanukovich.